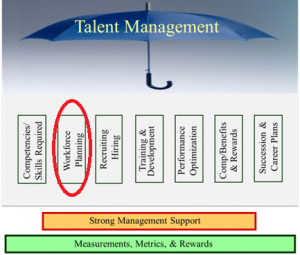 In the previous Talent Management Blogs, we defined “Talent Management” as a set of integrated organizational HR processes designed to attract, develop, motivate, and retain productive, engaged employees and we reviewed how to develop a set of skills and competencies to drive Job Descriptions, hiring criteria and Performance Management. This discussion should identify the strategic and operating gaps in your organization now and to determine if your organizational needs will be met in the future. What are the Strategic Human Capital needs? This is an integral part of your Strategic Business Planning process and will provide the future direction on numbers, skills, expansions, new products, corporation changes, etc. of your current organization; Numbers, skills, levels, locations, turnover. This tells you where you are now and with a comparison to your Strategic Human Capital needs you can create a strategic gap analysis.Utilizing a SWOT analysis during this stage will provide insight into emerging trends, technological changes, restructuring, and competition/environmental changes that you might not have considered previously. to close the gaps and move toward delivering the future needs. This plan will also provide input to most of the other Talent Management areas; Hiring Needs, Training requirements, performance assessments (leads to turnover percentages), and Succession Planning. While examining each of these areas and creating an Action Plan to deliver the future requirements, one will always need to include the financial implications. Make sure you have full Leadership alignment and participation in the plan. Some of the changes are very positive (training, role alignment, communications) but some carry a high perceived risk (unknown future, personal reassessment vs. future needs) and thus a proactive Communications Plan is a necessity. Monitor, Measure and Continuous Improvement Effectiveness. While Workforce Planning is a necessary part of your annual Strategic Planning Process, there are many steps that must be monitored and checked on a quarterly basis; unexpected turnover and changes in the business plan. And no matter how perfect your going in plan is, there are always changes required – that is the nature of continuous improvement. The obvious benefits from having a well-executed Workforce Planning process are to minimize current Human Capital gaps and to have a bench that is ready when your company needs the skills and resources to deliver even higher results. The next blog will cover how the Skills & Competencies and Workforce Planning processes work together to make your Recruiting and Hiring procedures work smoothly. Click on the following link to complete this simple HR Self-assessment. The free self-assessment takes only a few minutes and your results will be sent to you immediately along with information on how your company stacks up against benchmarked best practices. You can read the rest of our series on Talent Management here. Bruce Dougan is the head of Group50’s Organization Design and Development Practice. Bruce and the Group50 team are all former executives with well-known manufacturing and distribution companies who understand what it takes to design, train, develop and motivate organizations to successfully implement a company’s strategic plan. Group50 has designed a series of strategic assessments, workshops and strategic execution tools that optimize your organization. You can reach us at (909) 949-9083 or send a note to info@group50.com.